Guest Contribution by Hannah Deskin. 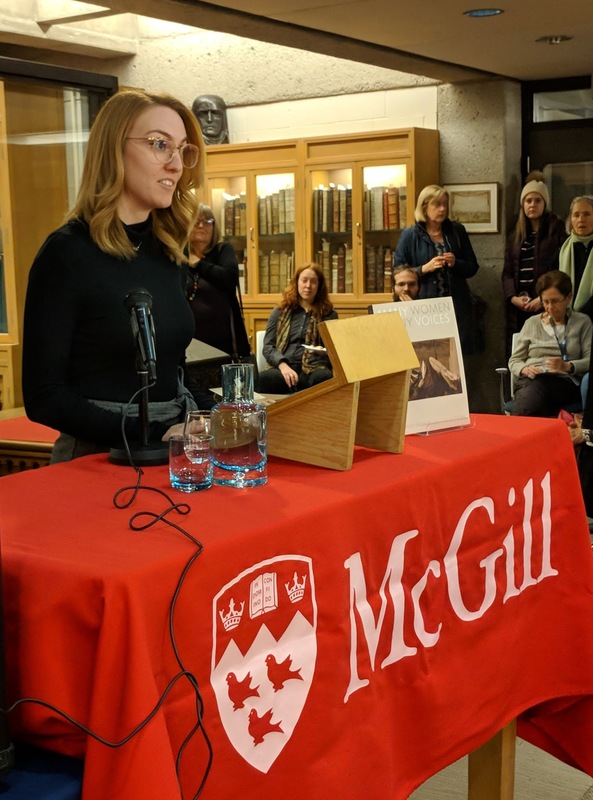 ROAAr launched its recent book Many Women, Many Voices; Stories from McGill Collections with a fanfare, a successful sale, and an excellent turnout on November 8th. ROAAr–that is the Rare Books & Special Collections, the Osler Library of the History of Medicine, the Visual Arts Collection, and the McGill University Archives– has spent the past year crafting this volume of illustrated vignettes. With the help of a wide range of contributors, this book celebrates women, shining a light on those who helped to shape McGill and Montreal into what they are today. The legacy of the ‘Donaldas,’ McGill’s first class of female students is a vibrant, 21st century library at the heart of the campus. This book is an invitation to discover our stories and our collections. 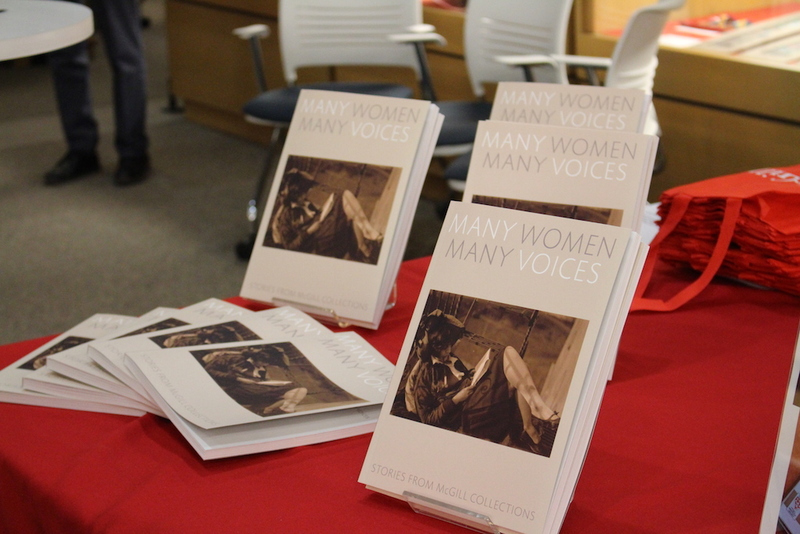 Many Women, Many Voices is now available for sale on site in Rare Books and Special Collections, and in store and online at McGill’s Le James Bookstore. Hannah Deskin, giving the speech below. The 1927 archival photograph that I wrote about for this publication has captured the imaginations of nearly everyone who has encountered it. Who is this mysterious young woman, and upon which fire escape on McGill’s campus has she ensconced herself? As she padded the stiff wrought iron with pillows, she clearly intended to stay a while. Unfortunately, many of the image’s details remain elusive, including the student’s identity and her exact location. Logic suggests that she occupies a rear emergency entrance of Royal Victoria College – a building donated by Donald Smith – that exclusively housed female student from its foundation in 1899, until some wings of the building became the home of the Schulich school of Music, while other sections became co-ed residences in 2010. Yearbooks from the twenties can tell us a great deal about the era affectionately known around campus as “the dancing years.” Similar photographs suggest that galleries and porches on campus were popular spots for ladies of the university to convene, often making appearances in furs and well-appointed hats. Other photos taken around the same time reveal that fire escapes became popular haunts for female students seeking more discreet spaces. However, our mysterious friend pictured here does not seem to inhabit any of these locations, based on the distinctive construction of the building and the unique railing that surrounds her. As other photographs suggest, she may have gone beyond the sheltered confines of RVC, and perhaps instead occupied the fire escape of an academic building. Although we could not pinpoint the exact location of this photograph, the theory of it being an academic building has become more and more plausible. While yearbooks tended to focus on student life, full of snapshots of spaces where students congregated in great numbers like residence halls, Royal Victoria College and student unions, they rarely included images of young female students studying alone in less-than-legal locations. Not to mention the fact that she ignores the prohibition of women smoking on campus. Looking for evidence of fire escapes on buildings other than RVC, my colleagues and I combed through several other archival sources. Eventually, we came across several images taken of the Student Union building in 1912. In several shots, there is a fire escape emerging from a third floor window. Although we are certain that this is not the exact fire escape that we see in this photo, it does prove that fire escapes existed on many buildings across campus. This trend followed the outbreak of several large-scale fires in the city. McGill was not immune to such disasters, and April of 1907 alone saw the outbreak of 2 devastating blazes on campus – one in the old medical building and another at MacDonald Engineering. Naturally, campus and city planners began to encourage construction methods that mitigated future disasters. After 1907, with fewer emergencies on campus, there evidently came an opportunity for students to use fire escapes as makeshift carrels. Other similar archival images of the same era may also show several women practicing their dance moves on a different fire escape, proving that such spaces were used for a variety of activities – some academic and others not so much. With the colourful lives of the female students who have come not long before me in mind, I would like to leave you with a quote that, in my opinion, sums up the experiences that many of us have had during our times at McGill – both on and off fire escapes. 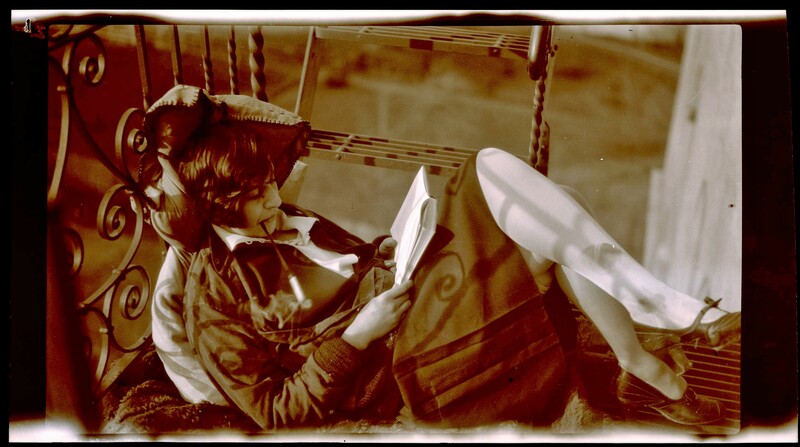 One female student remembered fondly an age of youthful emancipation and intellectual curiosity, upon graduating the same year as this photograph’s capture. In her own words, she states that:“[From] the class in Evolution and Genetics, to the dancing at the Mount Royal Club to the music of Jack Denny… [and] my mother’s discovery that the Redpath Library closed at 9 p.m. when I had been getting home regularly after midnight.”As these words might suggest, much has changed over the years, including how students make use of McGill’s campus and its many hideouts. But a few things remain the same: the irreplaceable life experiences a McGill education has had, and continues to have, upon generations of female students.